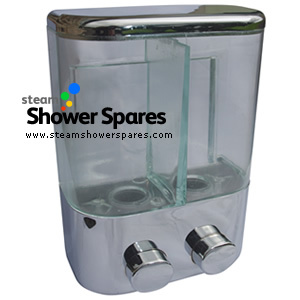 This soap dispenser is finished with a chrome finished lid and pump action button. The twin chambers enable you to have your shampoo and other condiments accessible in your shower. NOTE: It is important to ensure the liquid contents are able to be pumped out with ease whilst not being too runny as to drip constantly. If the dispenser drips, it is not normally a fault with the dispenser, but that the contents are not suitable.